It has always been true that the farther a wind turbine is from shore, the more expensive its maintenance. To solve this problem, Siemens Gamesa came up with service operation vessels. If you are interested in similar cases involving service operation vessels or have any other questions, please do not hesitate to contact us. Offshore wind energy can make a significant contribution to securing energy supply. To achieve this, however, wind turbines must be reliable and affordable. Due to their location at sea, offshore wind projects have higher planning, equipment and installation costs. Also, operation and maintenance are more expensive under the harsh conditions at sea and far away from shore. According to the IRENA’s 2017 renewables cost report, fixed and variable operating costs can account for as much as 20 to 25% of the levelized electricity cost of an offshore wind project. By improving our service efficiency, we can help our customers achieve optimal performance from their wind turbines and help advance the competitiveness of offshore wind energy for the future. The wpd group – a partner for the development, financing, construction and operation of wind farms on land and at sea based in Germany – knows that in order to lower offshore costs, it is especially important to save money on turbine maintenance. That is why wpd commissioned Siemens Gamesa not only to supply 80 3.6 MW offshore wind turbines, but also to provide a tailor-made concept for the maintenance and repair of the Butendiek wind power plant. wpd’s Butendiek wind farm is located off Germany’s North Sea coast, and with a total capacity of 288 megawatts it has supplied some 370,000 households per year with ecofriendly electricity since 2015. To enhance the quality of service and reduce the costs of electricity, Siemens Gamesa developed a service ship that can stay out at sea near the Butendiek wind park for several weeks at a time. The service operation vessel, or “SOV” for short, is equipped with cutting-edge technology and can accommodate up to 40 service technicians. 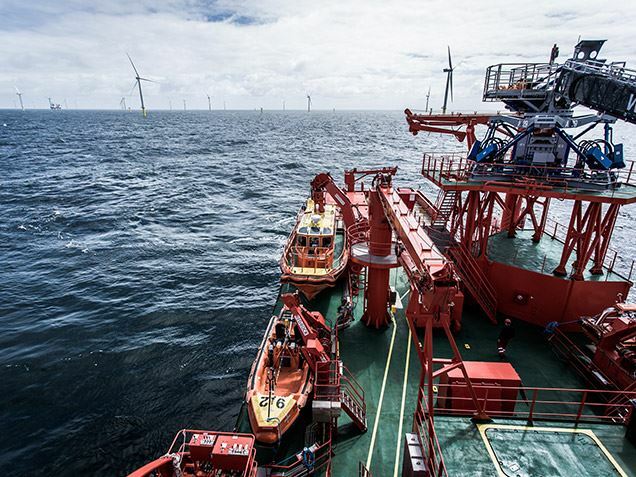 The SOVs can do two things that normal service ships can’t do: They can stay in the wind park even in rough weather and wind conditions, and – thanks to the hydraulic bridge – they can reach the turbines more often than is possible using normal entry systems. Today, this makes them the most effective way to service offshore wind power plants. Unstable weather conditions, rough seas, and long distances to the coast can make offshore service costs difficult to calculate for wind power plant operators. Siemens Gamesa’s Service Operation Vessels (SOVs) rise to this challenge: They help make the new generation of offshore wind power plants more efficient and profitable. Accommodation for 40 technicians: Because full manpower is always on board, service is performed more quickly, thus helping to reduce downtime. 305 m² on deck and capacity for 8 containers: room for storing spare parts and all the necessary material on board. Up to three weeks at sea: Daily transit is time-consuming and costly for wind farms far from shore. 10 hours of work during a 12-hour shift: Always being on site means that technicians have more time for actual maintenance work. Only 10 to 15% of weather related downtime: SOVs can safely withstand the harshest conditions even in winter. Wave heights of up to 2.5 meters: Thanks to a hydraulic gangway, technicians can safely “walk to work” even in rough weather. This ultimately enhances the quality of service and, thus, the reliability and availability of the wind turbines at the Butendiek wind power plant. There is enough space for up to 40 technicians on board a service operation vessel. 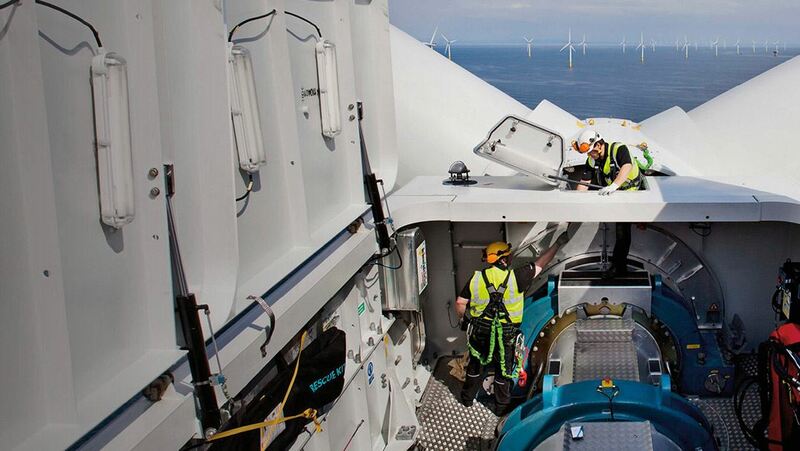 They ensure that the wind turbines keep running day to day: not an easy job! 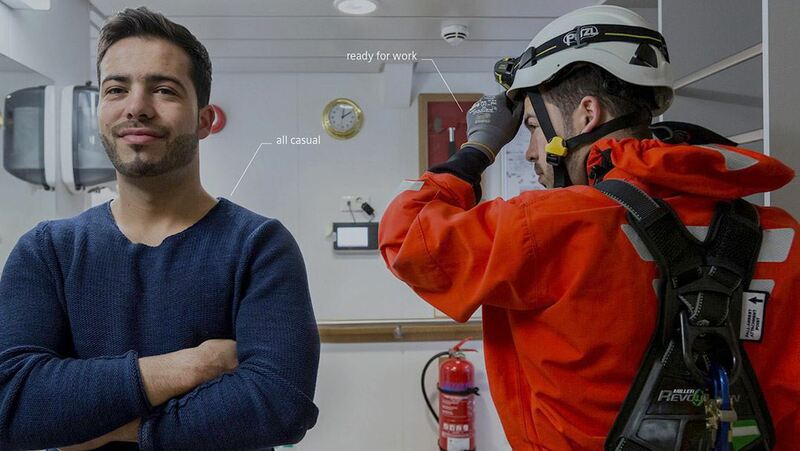 Experience a day in the life of one of our technicians at work – you will be surprised how comfortable life on board can be. Erhan Erdönmez is an offshore service technician at Siemens Gamesa. Experience a day with him on the service operation vessel. 6 am – Breakfast: Erhan's day starts with a good breakfast with his colleagues. Balanced nutrition is important, as he has to be in shape for his job on the offshore turbine. "The food is tasty and fresh. You can find everything your heart desires." 6:30 am – Team Meeting: Every morning the team discusses in the conference room what went well, could be improved or needs to be done next. Today, the 30 members learn about the characteristics of the wind park and the planned control tests. Erhan finds out about his coworkers and tasks. "Our boss has put together a great team. Everybody is technically qualified, gets along great, and is in good shape." 9 am – Putting on the Equipment: To enter the turbine, service technicians need their personal protection equipment. 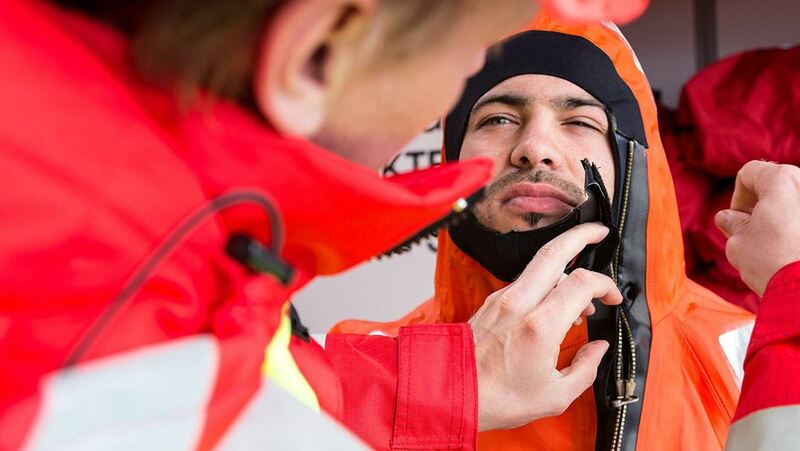 Erhan puts on safety glasses, a helmet, safety shoes, a survival suit and a climber kit. In the meantime, he gets his final instructions. 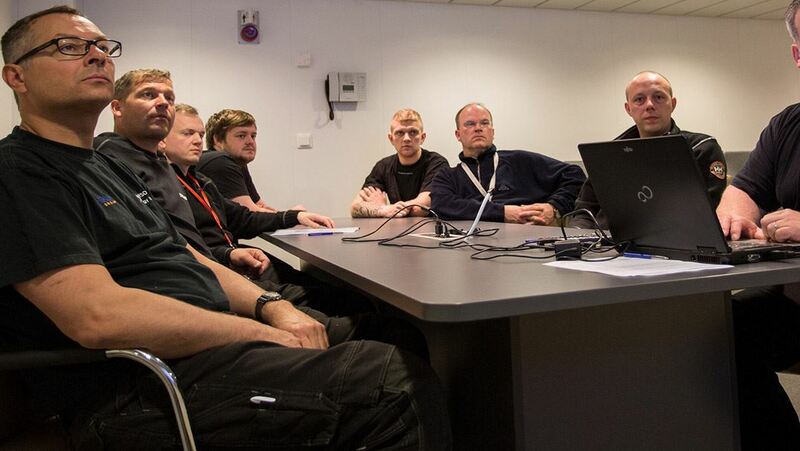 During the training period, several safety training sessions have to be completed successfully. This way the team feels safe and ready for every operation. "Everything I learned in the training, I need every single day at work." 9:30 am – Transition: Erhan leaves the vessel via a hydraulically stabilized gangway to reach the turbine. Thanks to the bridge, he reaches his workspace safely even when there are high waves. Afterwards, Erhan’s toolbox with his instruments is carried onto the turbine by crane. Then he gets started. 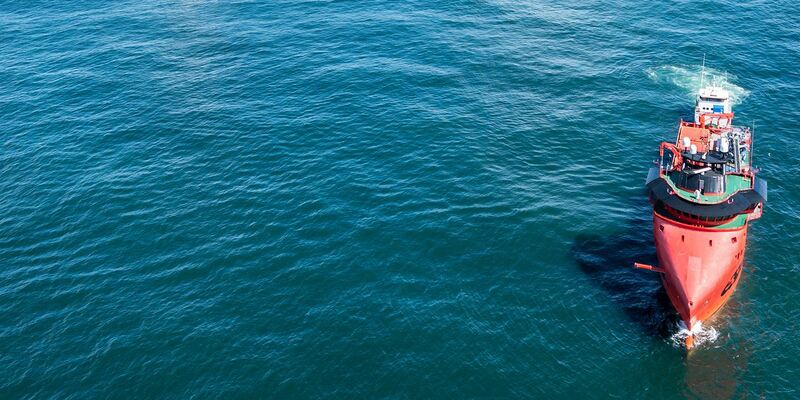 "Not everybody is able to work offshore. You have to be physically and mentally fit. You are entrusted with a high level of responsibility." 10 am – Working on the Turbine: Erhan and his team do different kinds of operations. Big service operations can take several days. When “snagging,” technicians can service several turbines in one day. When operating on older turbines, fault clearing is sometimes on the schedule. In any case, it is important that the team spirit is alive. "Even on tough days, working with my colleagues is fun. And that's what counts!" 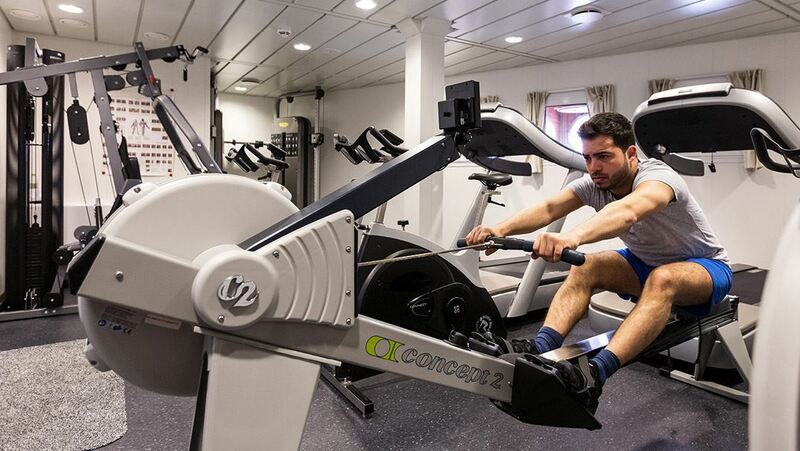 4 pm – Spare Time Part 1 – Fitness: Once the job is done, Erhan and his colleagues like to hit the gym on board the vessel. This way the crew stays fit. 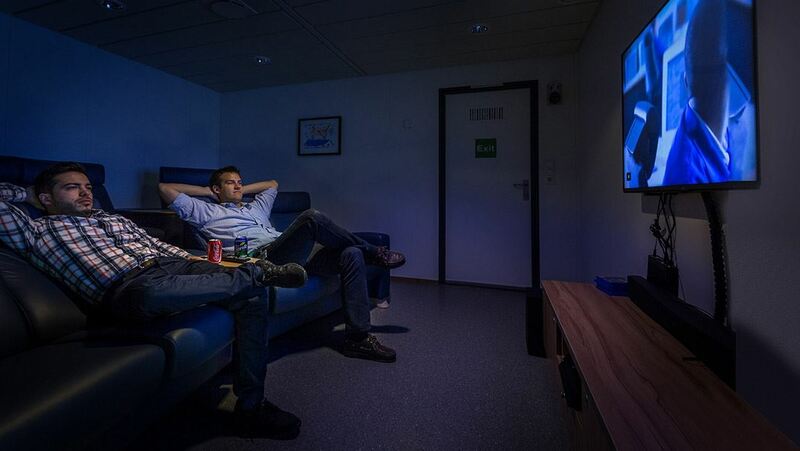 But there are also several ways to relax on board: a shared lounge, a library and a cinema for collective movie nights. "Mission accomplished: the client is happy, the turbine is running – now we can start our evening." 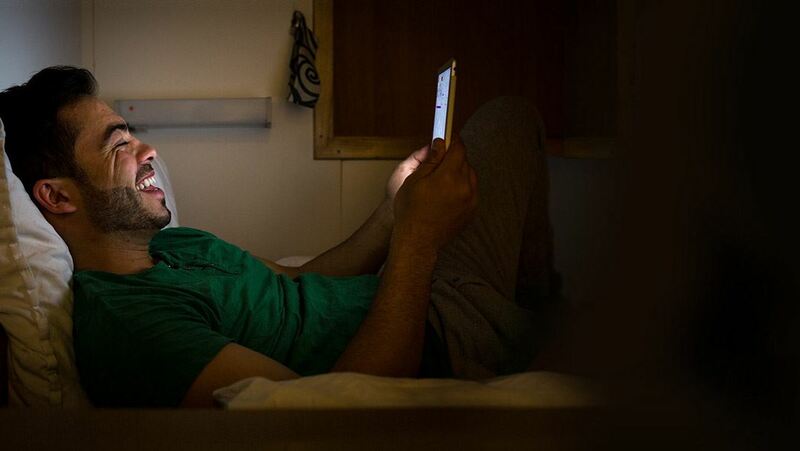 7 pm – Spare Time Part 2 – Cinema: Erhan stays at the offshore wind park for 14 days at a time, followed by 14 days off. 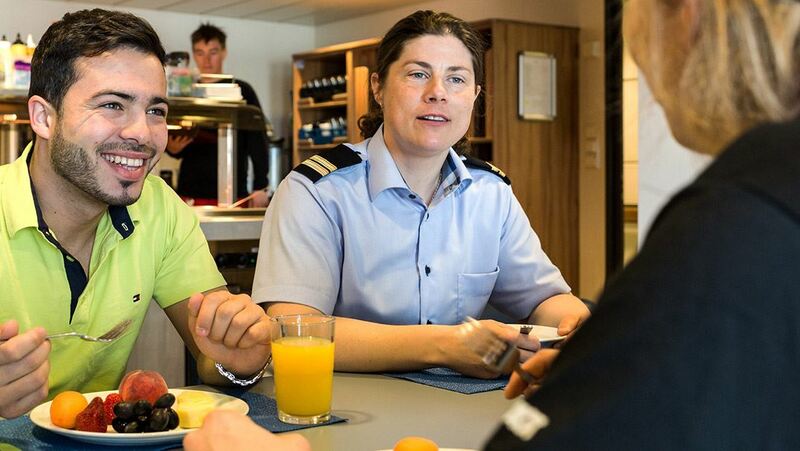 He does not mind the long time on board because he and his colleagues keep busy in the evenings: They watch movies or play poker, chess or PlayStation. 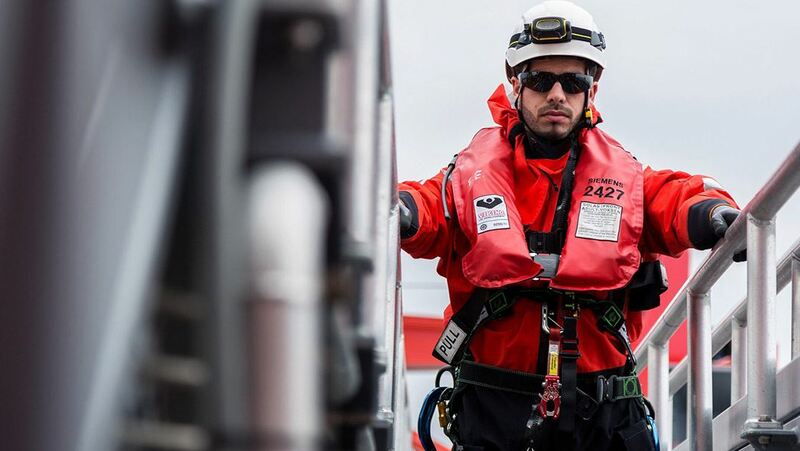 Moreover, Erhan is well rewarded for his hard work thanks to an offshore allowance from Siemens Gamesa – even when he has to stay on the vessel because of bad weather conditions. "We are such a great mixture of young and experienced employees with different nationalities." 9 pm – Spare Time Part 3 – Private Cabin: At the end of a long day, Erhan retires to his private cabin. He enjoys being by himself and writing poems to balance out his tough job. He also takes the opportunity to chat with his friends and family onshore. "A job in an office – that is something I really can't picture for myself." Munich has an ambitious plan to supply itself with 100% renewable energy. How can the DanTysk offshore wind farm help?